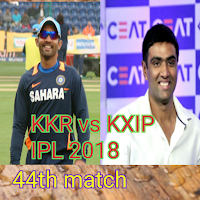 KKR 245/6 in 20 overs KXIP 214/8 in 20 overs. 44 match of IPL 2018 being played Holkar Cricket Stadium Indore. KXIP won the toss and elected to bowl first. KKR's batsman played an amazing inning and scored 245/6 in 20 overs. This score is the 4th highest score of IPL history and highest of KKR'S history. It is also the highest score of IPL 2018. Sunil Narine 75 of 36 delivery with 9 4s and 4 6s. Dinesh Kartik 50 of 23 delivery in which he smashed 5 4s and 3 6s. Andrew Russell 31 of 14 with 2 4s and 3 6s. Chris Lynn (27 of 17), Uthaya(24 of 17), Nitish Rana(11 of 4), Shubhman Gill(16 of 8) and Navin Searles scored 6 runs after facing only one delivery. Andrew Tye got 4 wickets, Mohit Sharma and Barinder Saran got 1 -1 wicket. KKR scored 245/6 in 20 overs. KXIP lost his 2 wickets in the 1st powerplay. Chris Gyle 21 of 17 and Mayank Agrawal without scoring. KL Rahul still playing very well on 44 after 7 overs. KXIP 69/2 in 7 overs. KL Rahul got his fifty in 22 delivery. Rahul(66 of 29, 2 4s and 7 6s), Gyle (21), Finch(34), Acer Patel(19), In this match no of sixes is more than fours. Ravichandran Ashwin played amazing inning but couldn't be achieved team to win. Andrew Tye(14) and Ashwin scored 45 of 22 delivery in which he smashed 4 4s and 3 6s. KXIP scored 214/8 in 20 overs. KKR won the match by 31 runs.